Open water on the Huntington River between a pair a hemlocks. This morning in Huntington at 6:20AM it’s currently 31 degrees under overcast skies. Winds are calm. Relative humidity is 97%, dewpoint 30, barometric pressure 29.56″. We picked up 0.25″ of rain and 0.5″ of snow in the past 24hrs and have 4″ on the ground at the stake. 24hr high was 39, low 31. The low pressure system that delivered yesterday’s tempestuous weather is slowly wheeling to our north and east this morning. We’ll continue to see scattered snow and rain through the day today and into the weekend. Today we’ll have overcast skies with snow showers and rain showers, then rain showers in the afternoon particularly in valley locations. Highs will be around 45F with winds from the WSW at 5 to 10 mph. Chance of precipitation is 70%. Tonight should be overcast with snow showers, then a chance of snow after midnight. Lows will be around 27F with winds less than 5 mph. Chance of snow is 60% with accumulations up to 1″ possible. Friday should be overcast with a chance of snow. Highs will be around 34F with a windchill with winds from the NNW at 5 to 15 mph. Chance of snow is 50%. Friday night should be overcast with snow showers. Lows will be around 27F wit winds from the NNW at 5 to 10 mph. Chance of snow is 60% with accumulations up to 1″ possible. Saturday’s looking overcast with a chance of snow in the morning, then mostly cloudy with a chance of snow. Highs will be around 34F with winds from the North at 5 to 10 mph. Chance of snow is 50%. Saturday night should be overcast with a chance of snow. Lows will be around 18F with winds from the NNW at 5 to 10 mph. Chance of snow is 50% with accumulations up to 1″ possible. Last year on this date we had a high of 33 and a low of 11. We picked up 1.25″ of snow and had 4.5″ on the ground. Burlington norms for this date are highs of 34°F and lows of 16°F. Record high was 55°F in 1903. Record low was -17°F in 1920. Tomorrow will be 3m 3s longer. The Moon is waning gibbous, 18d 4h old with 92% illumination. 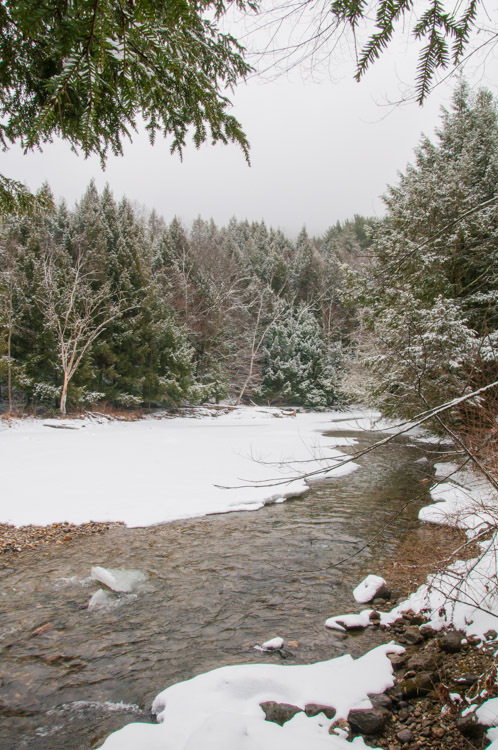 Snow-dusted hemlocks along the Huntington River. This morning in Huntington at 6:55AM it’s currently 33 degrees under mostly cloudy skies. Winds are out of the SE at 3-4 mph (I can hear it roaring up on the sides of Camel’s Hump…). Relative humidity is 82%, dewpoint 29, barometric pressure 29.94″ and falling rapidly. 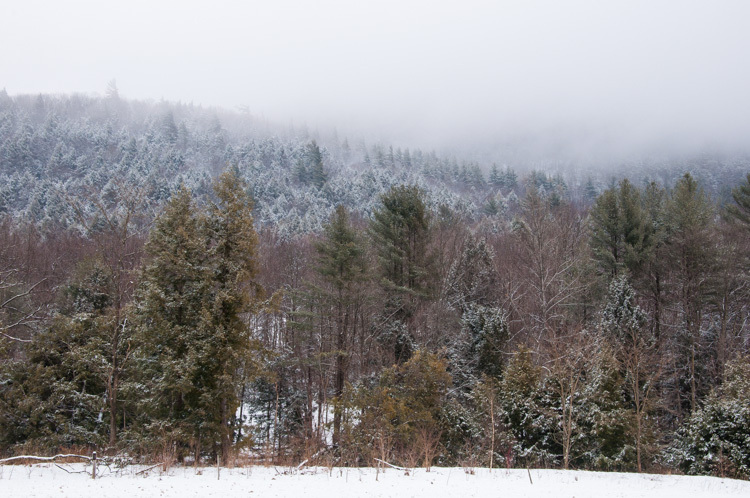 We picked up a dusting of snow overnight and have 4″ on the ground. 24hr high was 44, low 33. There is a Wind Advisory in effect for our region until 7:00PM this evening. Two low pressure systems–one parked out over the Great Lakes and one making its way up the Atlantic coast–will deliver a messy mix of snow, sleet and rain over the next 48 hours. We’ll see overcast skies with snow and rain this morning then snow and a chance of rain in the afternoon. High will be around 36F with winds from the East at 5 to 10 mph gusting to 40 mph. Chance of snow is 90% with accumulations up to 1″ possible. Tonight will be overcast with snow, then snow showers and a chance of rain after midnight. Lows will be around 30F with winds less than 5 mph. Chance of snow 60% with accumulations up to 2″ possible. Higher totals should occur south of us and over higher upslope terrain. Maybe MRG will luck out but it hasn’t really been a winter for that now has it? Thursday should be overcast with a chance of snow and rain showers, then a chance of rain in the afternoon. High will be around 45F with winds less than 5 mph. Chance of precipitation is 60%. Thursday night should be overcast with a chance of snow. Low will be around 28F with winds less than 5 mph. Chance of snow 40% with accumulations up to 1″ possible. Friday’s looking overcast with a chance of snow. High will be around 36F with winds from the North at 5 to 10 mph. Chance of snow is 30%. Friday night should be overcast with a chance of snow. Low will be around 21F with winds from the NNW at 5 to 10 mph. Last year on this date we had a high of 42 and a low of 6. We had 4.5″ of snow on the ground. Record high was 57°F in 2000 (we had a high of 61). Record low was -21°F in 1963. Tomorrow will be 3m 0s longer. The Moon is waning gibbous, 17d 5h old with 97% illumination. Snow-dusted pines and spruce across the Huntington River at the Audubon Center yesterday. This morning in Huntington at 7:20AM it’s currently 28 degrees under overcast skies. Winds are calm. Relative humidity is 97%, dewpoint 28, barometric pressure 30.30″ and rising. We picked up a 0.5″ dusting of snow overnight and have 5″ on the ground. 24hr high was 34, low 28. Weak high pressure over the region today will give us mostly cloudy skies this morning then partly sunny skies later today. Highs around 40 with light and variable winds. A strong low pressure system will move northeastward out of the Ohio River Valley tonight bringing partly cloudy skies with isolated rain or snow showers until midnight, then mostly cloudy skies with scattered snow or rain showers after midnight. Lows will be in the upper 20s with southeast winds 10 to 15 mph gusting up to 30 mph after midnight. Chance of precipitation is 50%. The slow moving low will be upon us Wednesday delivering a sloppy mix of rain or snow showers. As we’ll be on the downslope and shadowed side of this storm, forecasts are calling for our region (the Champlain Valley and western slopes of the Greens) to be on the drier and warmer side of the event, with snow accumulation of a dusting to 2 inches possible mixed with rain and sleet. Higher accumulations will be seen to our south and east (once again…) It’ll be breezy with highs in the upper 30s and east winds 15 to 25 mph. Chance of precipitation is 70%. Rain and snow will continue into Wednesday night with additional light snow accumulation possible. Temperatures will remain near steady in the mid 30s with east winds 10 to 15 mph. Chance of precipitation is 70%. Thursday will bring lingering rain showers or scattered snow showers with additional light snow accumulation possible. Highs will be in the upper 30s with light and variable winds. Chance of precipitation is 60%. Thursday night should be cloudy with a 50% chance of snow showers and lows in the lower 20s. Burlington norms for this date are highs of 34°F and lows of 15°F. Record high was 60°F in 1957. Record low was -19°F in 1970. Tomorrow will be 3m 1s longer. The Moon waning gibbous, 16d 5h old with 99% illumination. 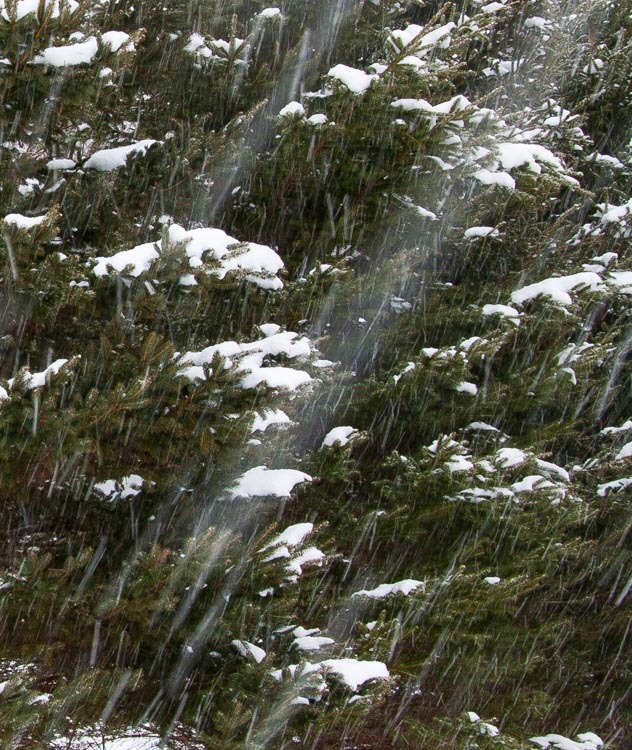 Snow falling in front of dark spruce trees. 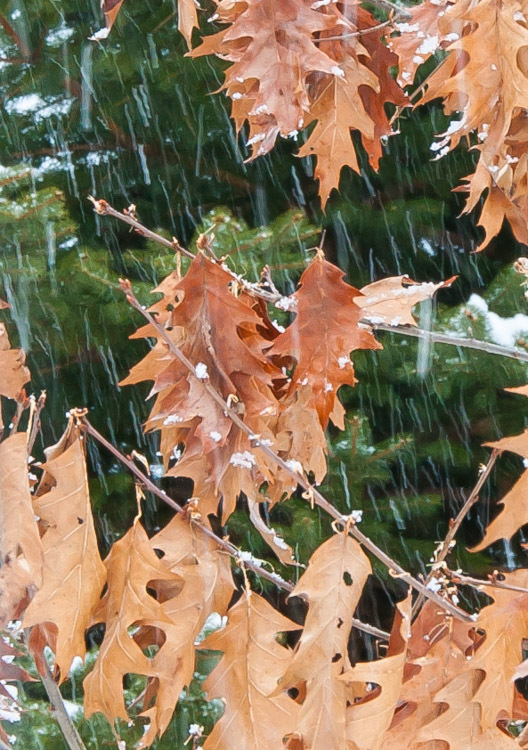 The shutter speed is set at 1/10th of a second rendering the long trails as the flakes fall. This morning in Huntington at 7:20AM it’s currently 30 degrees under overcast skies. Winds are calm. Relative humidity is 96%, dewpoint 29, barometric pressure 30.07″ and rising. 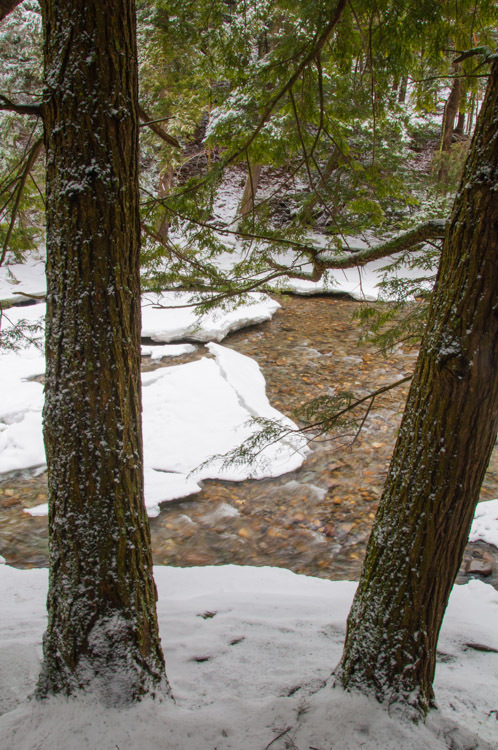 We picked up 0.03″ of melted precipitation and 0.75″ of dense snow. We have 5″ on the ground. 24hr high was 36, low 30. Weak high pressure will built into the region today. We’ll see mostly cloudy skies with a slight chance of snow showers this morning. Highs will be in the mid 30s with north winds around 10 mph this morning, becoming light and variable. Chance of snow is 20%. Tonight should be mostly cloudy with lows around 19 and light and variable winds. Tuesday should be partly sunny with highs around 40 and light and variable winds. The next storm system approaches out of the Ohio River Valley Tuesday night bringing mostly cloudy and a 50% chance of snow. Lows will be in the mid 20s with southeast winds 10 to 15 mph gusting up to 25 mph. A potent low pressure system will affect us Wednesday bringing rain or a chance of snow. At this point it’s hard to say how much warm air will be mixing with this system, so amounts of snow/rain are up in the air (literally!). Highs will be in the upper 30s with southeast winds 15 to 20 mph gusting up to 35 mph. Chance of precipitation is 70%. Snow or rain will continue into Wednesday night. Lows will be in the upper 20s. Chance of precipitation is 80%. Thursday snow showers are likely. Highs will be in the mid 30s with overnight lows in the mid 20s. Chance of snow is 70%. Last year on this date we had a high of 35 and a low of 18. We picked up 0.02″ of rain and 1.75″ of snow and had 1.75″ of snow on the ground. Burlington norms for this date are highs of 33°F and lows of 15°F. Record high was 55°F in 1985. Record low was -17°F in 1962. The Moon is the full “Snow” moon (Northeast Native American, Neo Pagan Wiccan). Other names for this full moon include: “Trapper” (Colonial American), “Wold” (English), “Ice” (Celtic), and “Storm” (Medieval Wiccan). 15d 5h old with 100% illumination. I’ve collected all of the images appearing in this blog into a Photo Gallery page. Look for the link at the top right of the page of each daily posting. Several people have asked me about purchasing images. If you’re interested, just post a comment and I’ll get in touch with you. Eventually I’ll get around to setting up a more “official” gallery site if I get enough interest. Falling snow traces squiggly lines as it falls between dried oak leaves and dark spruce in our front yard. This morning in Huntington at 7:55AM it’s currently 32 degrees and snowing just a bit under overcasts skies. Winds are calm. Relative humidity is 95%, dewpoint 31, barometric pressure 29.81″. We picked up 0.03″ of melted precipitation and 0.75″ of heavy, wet snow overnight, and we have 5″ on the ground. 24hr high was 37, low 32. The two low pressure systems discussed yesterday–one now east of the Great Lakes and one off the New England coast–will continue to deliver rain and snow to the region today. Total snow accumulations will be in the range of of 1 to 3 inches with higher totals south of us. Highs will be in the mid 30s with light and variable winds, becoming northwesterly around 10 mph this afternoon. Chance of precipitation is 80%. Tonight should be cloudy with snow likely until midnight, then a chance of snow showers after midnight. Additional snow accumulations of a dusting to 1 inch are possible. Lows will be in the lower 20s with northwest winds around 10 mph until midnight, becoming light and variable. Chance of snow is 60%. Monday should start out mostly cloudy in the morning, then become partly sunny as high pressure builds in. Highs will be in the mid 30s with light and variable winds. Monday night should be partly cloudy with lows around 20 and light and variable winds. Tuesday’s looking partly sunny with highs in the upper 30s and light and variable winds. Tuesday night should be cloudy with a 50% chance of snow showers as the next storm system approaches from the southwest. Lows will be in the mid 20s. Last year on this date we had a high of 36 and a low of 23. We had no snow on the ground. Record high was 55°F in 1930. Record low was -18°F in 1914. The Moon is waxing gibbous, 14d 5h old with 98% illumination. 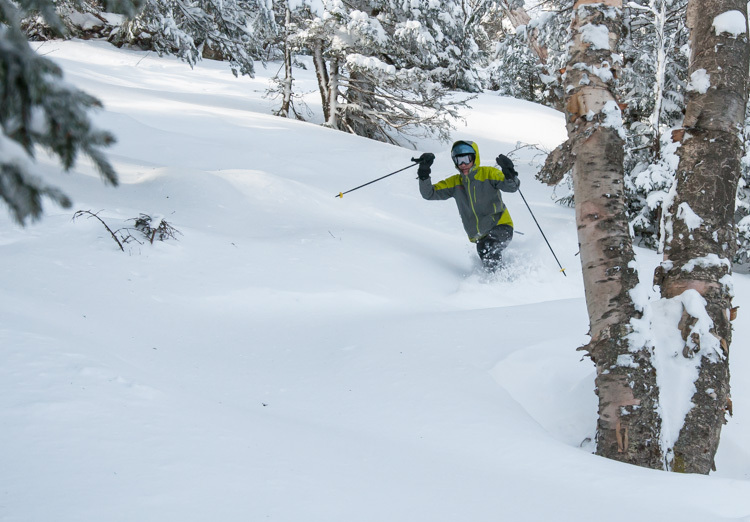 Eric Hanson cuts through the fresh powder at an undisclosed location somewhere near Mad River Glen. This morning in Huntington at 7:20AM it’s currently 33 degrees under overcast skies. Winds are calm. Relative humidity is 77%, dewpoint 26, barometric pressure 30.13″ and falling. We have 4.5″ of snow at the stake. 24hr high was 35, low 26. We’ve got some active weather heading our way for the next 48 hours. Two low pressure systems will approach the region today, one from the Great Lakes and one currently forming off the coast of Virginia, bringing a mixed bag of precipitation. With a fair amount of warm air pushing into the region, we’ll see cloudy skies with a chance of rain or snow mainly this afternoon. Highs will be in the upper 30s with south winds around 10 mph gusting up to 25 mph. Chance of precipitation is 50%. Rain or snow will continue into tonight changing over to snow after midnight. We can expect snow accumulations of a dusting to 2 inches, with higher total at higher elevations and south of our immediate region. Lows tonight will be in the mid 20s with southeast winds 10 to 15 mph. Chance of precipitation is 90%. High pressure will build into the region Monday bringing mostly cloudy skies with highs in the upper 30 and light and variable winds. Monday night should be partly cloudy with lows around 20. Burlington norms for this date are highs of 33°F and lows of 14°F. Record high was 56°F in 1984. Record low was -22°F in 1972. Tomorrow will be 2m 59s longer. The Moon is waxing gibbous, 13d 5h old with 94% illumination. 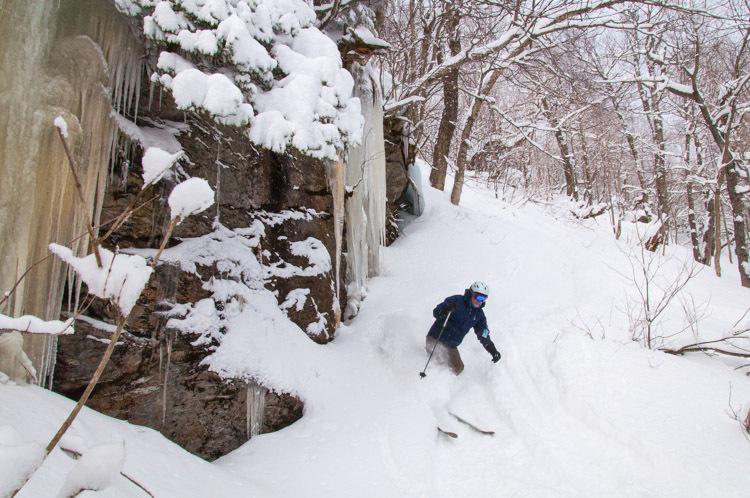 Lee Baughman shreds the powder under a cliff band at Mad River Glen yesterday morning. This morning in Huntington at 6:45AM it’s currently 8 degrees under clear skies. Winds are calm. Relative humidity is 90%, dewpoint 5, barometric pressure 30.43″ and rising. We picked up only 0.75″ of new snow during the day yesterday and have 6″ on the ground this morning. 24hr high was 21, low 8. High pressure building in today will yield a dry and sunny day. We’ll see partly to mostly sunny skies with highs in the mid 30s and light and variable winds. Tonight should be partly cloudy with lows in the lower 20s and light and variable winds. Two low pressure systems will approach the region on Saturday, one from the Great Lakes and one along the Atlantic coast bringing persistent light snow to the region Saturday through Sunday. We’ll see cloudy skies Saturday with light snow likely mainly in the afternoon. There may be a trace of rain in the Champlain Valley, but precipitation should remain as snow over most of the region. Expect snow accumulations of a dusting to 2 inches. Highs will be in the mid 30s with south winds around 10 mph and gusting up to 25 mph. Chance of snow is 70%. Snow will continue into Saturday night with additional light accumulation. Lows will be in the mid 20s with south winds around 10 mph gusting up to 25 mph. Chance of snow is 90%. Snow will continue into Sunday with Additional light accumulations. Highs will be in the lower 30s with light and variable winds. Chance of snow is 90%. Sunday night should be cloudy with a 40% chance of snow showers. Lows will be in the lower 20s. Expect snow totals over the 48 hour period to be in the range of 3 to 7 inches with higher totals south and the snow being fairly wet and heavy. Last year on this date we had a high of 48 and a low of 33. We had 1.5″ of snow on the ground. Burlington norms for this date are highs of 32°F and lows of 14°F. Record high was 61°F in 1981. Record low was -20°F in 1963. Tomorrow will be 2m 58s longer. The Moon is waxing gibbous, 12d 4h old with 89% illumination.